Amazon Uses AR (Augmented Reality) For Part Finder Technology - Gooii: Award Winning Website Design & App Development Nottingham. iPhone, iPad & Android Apps. Virtual Reality & Augmented Reality. Amazon quietly updated the camera search on its iOS app with a new Part Finder. It lets you search for specific nuts and bolts that you might need more of, but need help identifying it. If Amazon’s Augmented Reality tech can figure out what it is, the app will help you easily buy more of the random screw you’re searching for. To use Part Finder, iPhone users can open Amazon’s app and tap on the camera beside the search bar. Select Part Finder, which has a screw as its icon. To help with scale, align the part you’re looking at above a penny and tilt your phone until it’s centered. 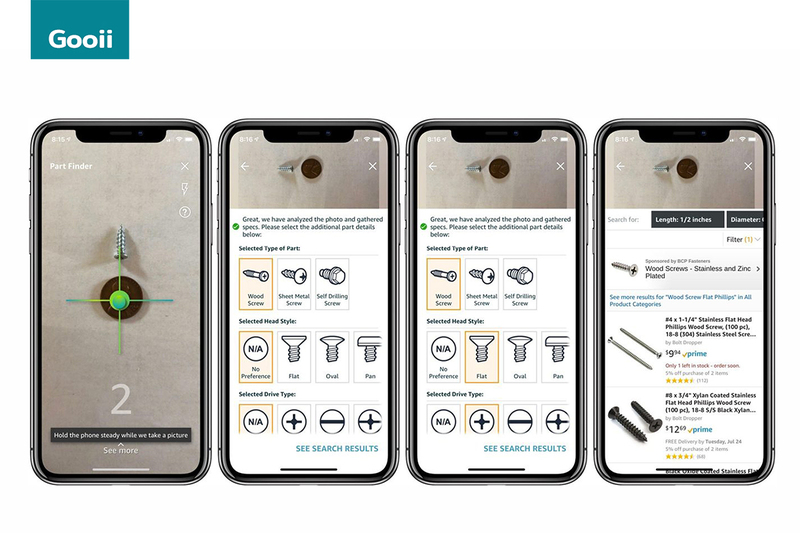 Part Finder uses the AR capabilities of the iPhone camera to measure the depth and width of the part, and leaves other aspects of identification — like the head style and drive type — to you. Interestingly enough, Amazon acquired a visual recognition company in 2016 called PartPic. They specialised in identifying small parts therefore Part Finder is likely the integration of their technology into the Amazon app. Amazon says Part Finder currently works for fasteners, meaning screws, nuts, bolts, and washers, but the feature will expand to include other replacement parts soon. The feature is currently only on iOS, and there’s no word on when it will arrive on Android. Adding innovating and time saving features like this to an app can give you distinct competitive advantage. If you wish to work with the talented Virtual & Augmented Reality, web or app team at Gooii Nottingham then please get in touch here.